According to the network theory of mental disorders, mental disorders are developed and sustained through direct interactions between symptoms . From this conceptualization it follows that treatment of mental disorders should involve changing the network of interrelated symptoms. While over the past years many studies have investigated the network structure of psychopathologies , the effect of psychological treatment on the network of interrelated symptoms has rarely been assessed. Moreover, network analysis techniques provide a unique opportunity to investigate treatment effects at a more detailed symptom level. In this new study we aspired to adopt and extent the network approach to investigate specific and sequential treatment effects—a technique we labelled Network Intervention Analysis (NIA) . NIA involves estimating a network of interrelated symptoms and including an additional treatment indicator variable that encodes the treatment condition that a participants belongs to. Including such a variable into the network allows to see which symptoms are conditionally dependent on this treatment variable. Since the treatment can influence the symptoms but not vice versa, this dependency indicates the symptoms that are directly affected by treatment. In our illustration of NIA we investigated the effect of cognitive behavioral therapy for insomnia (CBTI) on co-occurring insomnia and depression symptoms. More traditional analyses had showed that after completion, the treatment had relieved both insomnia and depression symptoms . It remained unclear, however, whether the effect of treatment on the depression symptoms occurred via improving the sleep problems, or whether CBTI influenced the depression symptoms directly. Using NIA across 10 measurement weeks (2 prior to treatment, 5 during treatment, and 3 after treatment) we could identify that CBTI predominantly affected the sleep problems, indicating that the improvements in depression likely occur via CBTI-induced improvements in sleep. Figure. Network structure before, during, and after treatment. The networks include the Insomnia Severity Index and Patient Health Questionnaire items (circles) and treatment (square). The size of the node is proportional to the difference in symptom severity between the treatment and control group, where smaller node sizes represent greater differences in favor of the treatment group. All ten networks corresponding to each of the measurement weeks are shown in the paper. An animated version can be found online. This paper is a first illustration of how NIA can be used to investigate sequential and symptom-specific treatment induced changes over time. We hope to further develop NIA into a more sophisticated technique to investigate treatment effects over time—to ultimately better understand treatment mechanisms and reveal clues to their optimization. Borsboom, D. (2017). A network theory of mental disorders. World Psychiatry, 16, 5-13. Fried, E.I., Van Borkulo, C.D., Cramer, A.O.J., Boschloo, L., Schoevers, R.A., Borsboom, D. (2017). Mental disorders as networks of problems: A review of recent insights. Social Psychiatry and Psychiatric Epidemiology, doi.org/10.1007/s00127-016-1319-z. Blanken, T.F. *, Van der Zweerde, T.*, Van Straten, A., Van Someren, E.J.W., Borsboom, D., Lancee, J. (2019). Introducing Network Intervention Analysis to investigate sequential, symptom-specific treatment effects: A demonstration in co-occurring insomnia and depression. Psychotherapy and Psychosomatics, doi.org/10.1159/000495045. Van der Zweerde T, Van Straten A, Effting M, Kyle SD, Lancee J. (2018). Does online insomnia treatment reduce depressive symptoms? A randomized controlled trial in individuals with both insomnia and depressive symptoms. Psychological Medicine, 49, 501-599. Busy times at the Psychosystems group! In 2018, Max Hinne joined us as a postdoc, working on a position shared between Psychosystems and Eric-Jan Wagenmakers’ Bayesian research group (the people behind the fantastic JASP program, which now incorporates a network analysis module designed by Don van den Berg). Max studies ways to integrate information on network structure and network dynamics by utilizing Bayesian approaches. Also in 2018, NWO-Veni laureate Maarten Marsman, who works on network models in the context of educational measurement, was awarded a research fellowship at the Institute for Advanced Studies in Amsterdam. In addition, Ria Hoekstra and Julian Burger successfully applied for a Research Talent grant of the Netherlands Organization for Scientific Research and are starting their Ph. D. projects this month. Ria will study methods to address heterogeneity in network structures, with Denny Borsboom acting as promotor. Julian, whose primary location is at Groningen University with Robert Schoevers acting as promotor, will develop ways to translate dynamical systems theory and network modeling into tools that are useful in clinical practice. Sacha Epskamp, who (directly after winning the 2018 Psychometric Society Dissertation Award for his thesis on network psychometrics) secured an NWO-Veni project on network modeling which also happens to start this month, will be involved in the supervision of the new Ph. D. projects, acting as co-promotor and daily supervisor, while Maarten Marsman will also be involved in Julian’s project. Incidentally, Sacha was not the only person receiving praise for his Ph. 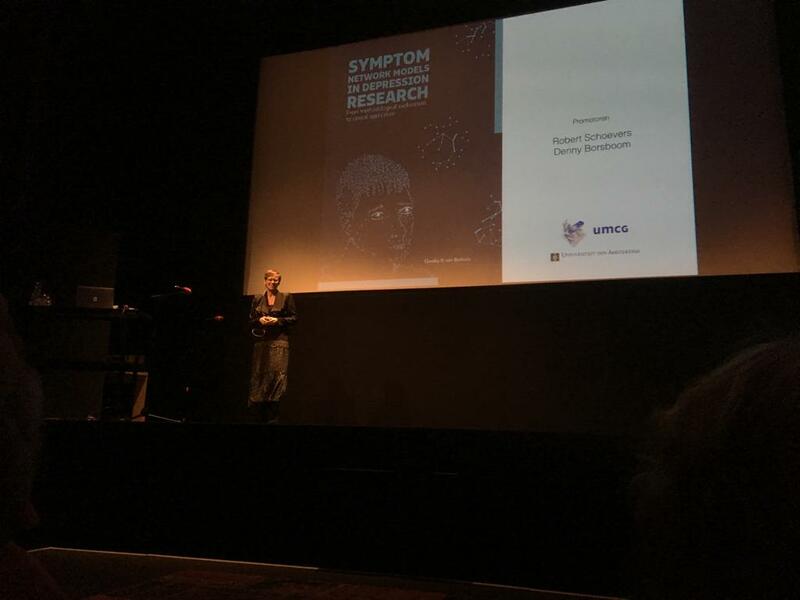 D. thesis this year, as Claudia van Borkulo finished second in the Van Swinderen Prize 2018 for her dissertation on symptom network models in depression research. Finally, Jonas Dalege is transitioning into a postdoc position this month; he will work on Denny Borsboom’s ERC consolidator grant in a joint position with the Social Psychology department at the University of Amsterdam.